Protect corporate information and data, manage threats and gain customer confidence. The way in which you look after and use corporate information can mean the difference between success and failure for your business. Get it right and you’ll grow your customer-base. Get it wrong and the risks and penalties can stop you in your tracks. ISO 27001 certification demonstrates that your business has systems in place to protect corporate information and data, whether this is online or offline. By gaining ISO 27001, customer and stakeholder confidence is increased and your company’s reputation is improved, allowing you to stand out amongst competitors. ISO/IEC 27001:2013 (ISO 27001) is the international standard that describes best practice for an information security management system (ISMS). Accredited certification to ISO 27001 demonstrates that an organisation is following information security best practices. We have consultants available Nationwide. Call us today to arrange your visit. Or fill in our enquiry form and we will get ack to you. Information is the lifeblood of any business – this is especially true if your clients have entrusted their data to you. Implementing and maintaining an information security management system (ISMS) certified to the internationally recognised data security standard, ISO 27001, is the most effective way of reducing the risk of suffering a data breach. An ISMS is a systematic approach to managing the security of sensitive information and is designed to identify, manage and reduce the range of threats to which your information is regularly subjected. ISO 27001 certification proves you are taking cyber security threats seriously. Your prospective customers are naturally concerned about the security of their data. Compliance with ISO 27001 is evidence that you are following the international best practice to mitigate threats. ISO 27001 certification demonstrates credibility when tendering for contracts. Conformity to the Standard can make the difference between winning and losing those all important tenders. ISO 27001 gives you a proven marketing edge against your competitors and gives additional credibility to your company. ISO 27001 certification helps you to demonstrate good security practices, thereby improving working relationships and retaining existing clients. ISO 27001 certification removes the need to complete additional detailed security questionnaires and responds to auditors for each new client. ISO 27001 certification helps you to expand into global markets. An ISO 27001 certificate is often a supply chain requirement, while in some countries such as Japan and India it is a legal requirement. ISO 27001 can be used to integrate with other ISO management system standards such as ISO 9001 and ISO 14001 to form a fully integrated management system governing all aspects of the company’s operations. When it comes to security breaches, loss of customer confidence can have far more serious consequences for an organisation than the fines levied by the Information Commissioner’s Office (ICO) or the Payment Card Industry (PCI). Cyber attacks are increasing in volume and strength daily, and the financial and reputational damage caused by an ineffectual information security posture can be fatal to a business. Data breaches not only damage your business but can be excessively costly. According to IBM, the average cost of a data breach is estimated at around USD $3.5 million. But intangible costs such as the loss of reputation can be far more costly in the long run. To date, the ICO (Information Commissioner’s Office) has issued penalties to organisations amounting to more than £5.5 million because of poor information security practices. ISO 27001 is the accepted global benchmark for the effective management of information assets, enabling organisations to avoid costly penalties and financial losses. ISO 27001 improves company culture. One fo the biggest threats today to companies It security is its own staff. Hence the Standard has a holistic approach covering the whole organisation, not just IT, it encompasses people, processes and your technology. This enables employees to readily understand risks and embrace security controls as part of their everyday working practices. ISO 27001 improves structure and focus. When a business grows rapidly, it doesn’t take long before there is confusion about who is responsible for which information assets. The Standard helps businesses become more productive by clearly setting out information risk responsibilities. ISO 27001 is the only auditable international standard that defines the requirements of an ISMS. The Standard is designed to ensure the selection of adequate and proportionate security controls that help to protect information assets. By providing a globally accepted indication of security effectiveness, ISO 27001 certification can negate the need for repeated customer audits, reducing the number of external customer audit days. Getting certified to ISO 27001 is quick and straightforward. Our expert consultants will work with you and your business to make the process as simple and easy as possible – highlighting and assisting you in making the necessary improvements to your current business processes. Our 3 step certification process ensures that you are assisted along every step in the process, and we even create your ‘information security management system manual’ for you, saving you time and money. Once you have achieved certification you must pass an annual audit to make sure your business stays on track. This fourth and final, stage in the process happens one year after your certification.. To get more details on what it takes to get ISO 27001, please see our implementation guide. Once you have achieved certification you’ll need to pass an annual audit to make sure your business stays on track. This stage in the process happens one year after certification. 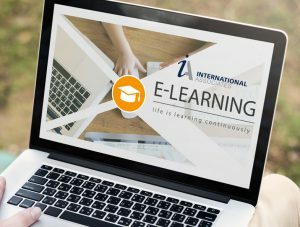 Here at IA, we offer online eLearning training modules to help with your implementation and the assessment. Find out more here. We understand I today’s challenging marketplace costs are crucial to decision making, however you also want to ensure a fast and efficient service. IA provides a route to ISO 27001 certification that doesn’t break the bank. The cost of certification can vary, depending on several factors, including your sector, number of offices, annual turnover, total staff, and whether you require UKAS accreditation. We focus on making ISO Certification simple and straightforward and make sure that we minimise the costs whilst staying within the assessment rules. Regardless of your organisation’s size, we will always quote a guaranteed Fixed Fee for certification, you will know all the costs upfront and there are no hidden fees. We can even give a Fixed Fee to include a full 3-year cycle of reassessment if you require. To find out how little ISO 27001 certification could cost you, use our Enquiry form, and we’ll email you your quote immediately. How long will it take to get ISO 27001? If your system is already up and running and you need simple assessment the certification can be as quick as 5 days, although this does, of course, depend on the size and complexity of your business. You may have heard about The Cyber Essentials scheme. This is a key deliverable of the UK government’s National Cyber Security Strategy and was released on 7 April 2014. It aims to provide reassurances about cyber risk management to UK-based organisations, clients and partners, and to ensure that risk management practices have been independently tested and verified, where relevant. The scheme provides a set of controls based on ISO 27001 that organisations can implement to achieve a basic level of cyber security. Organisations can attain certification to two levels: Cyber Essentials and Cyber Essentials Plus. Certified compliance with the scheme will be required in certain government procurement contracts. Learn more about this scheme, here.